“Let’s work together, we both have a China problem,” President Macron had asked, according to the source, who is reported by Axios to have been present at a meeting of the two men in the White House’s Cabinet Room on April 24th. After blasting the Brussels bloc, “he then went on a rant about Germany and cars”, the source added, presumably highlighting the EU’s protectionist car tariffs which the President has criticised before. When questioned about the exchange, White House Press Secretary Sarah Sanders, who was also in the room, did not specifically deny the words were spoken. “The broader point of the conversation was them wanting to work together to do something to fix the system,” she said. The EU taxes 10 per cent on car imports, compared to 2.5 per cent charged by the U.S., allowing German carmakers like Mercedes, Volkswagen, Audi, and BMW to export easily into America’s huge automotive market. 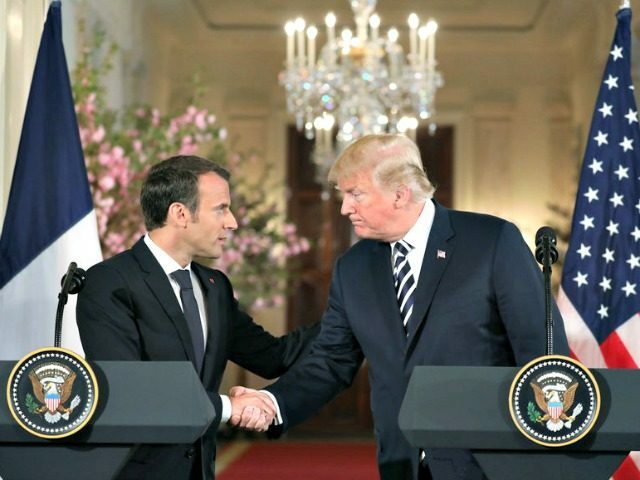 However, President Macron, German Chancellor Angela Merkel, and EU leaders attacked Mr. Trump for introducing tariffs on steel and aluminium imports, promising to legally challenge them at the World Trade Organization courts and promising billions of retaliatory tariffs on iconic U.S. goods such as motorbikes and blue jeans. President Trump, meanwhile, insists the metal tariffs are designed to save America’s rapidly declining smelting capability which is critical for national security reasons and the defence industry which has been hit by state-subsidised, artificially cheap Chinese steel. Over the weekend, President Trump also attacked Canada’s “massive tariffs to our U.S. farmers, workers and companies”. The President pointed specifically to Canada’s 270 per cent tariff on dairy products imported from across the border in the U.S. “They didn’t tell you that, did they? Not fair to our farmers!” he added on Twitter.